The march in Te Puke is the latest in a seriesof protests attended by AFFCO workers from around the North Island. Unionised meat workers at AFFCO-owned plants have been locked out for 77 days now as the company continues in its attempts to crush the union. But members of the Meat Workers Union have stayed staunch and refused to allow the company to run roughshod over their rights. We were proud to march with them today. AFFCO claims that the dispute is about managerial control. They say that the influence of the union is too great, and that it is hampering efforts to increase productivity. But behind the company’s complaint lies a speed-up. AFFCO is attempting to extract more work – more carcasses per hour – out of its workforce. Speeding-up production always comes at a cost – usually to health and safety. Furthermore, AFFCO has no plans to pay workers at its plants any more for the faster rate of production, but rather wants to reduce the coverage of collective agreements to ensure a more pliant workforce. Unsurprisingly, the union wasn’t having a bar of it. So when negotiations for a new agreement came up, AFFCO targeted some union members and locked them out. After their co-workers were selectively locked out, the remaining union members walked out in a series of one- and two-day strikes. The company responded by locking those workers out too. So now more than 1,000 workers are unable to work, and have to go without income. The company even issued a special lock-out over the four days of the Easter break, so that it didn’t have to give holiday pay to workers who belonged to the union. But the workers have continued to take the fight to the bosses – travelling all the way to Motueka to picket the house of AFFCO owner Michael Talley. At the most recent attempt at negotiations last week, workers were confronted with the bizzare sight of the AFFCO and the Talleys crying poor. “There has been considerable hardship to the company. It has been able to function, but at much lower levels of production. Pain is working both ways” AFFCO lawyers told the employment court last Wednesday. The Talley family, which owns AFFCO, are the fourth richest family in New Zealand with holdings of over $300 million. In reality, it is the workers who are hurting. The lockout is putting tremendous pressure on workers, who can no longer obtain an income to pay their bills. The strain is taking its toll on relationships. “It’s splitting up families”, says one worker who used to work alongside his two brothers at AFFCO Rangiuru. They’ve left to seek work in Australia with which to support themselves. Behind the struggle at the meat works lies a wider assault on the rights of all workers in New Zealand. It’s no co-incidence that the AFFCO lockout comes at the same time as the Ports of Auckland dispute and strikes at Oceania rest homes. Bosses across New Zealand are looking for ways to make workers pay for money lost during the recession, and hammering down pay and conditions, speeding up the pace of work and making working hours ‘flexible’ is how they want to do it. AFFCO’s own proposal to put new workers automatically on non-union individual agreements is something that the National Party wants to make law for all workers. But the fight is not over yet. 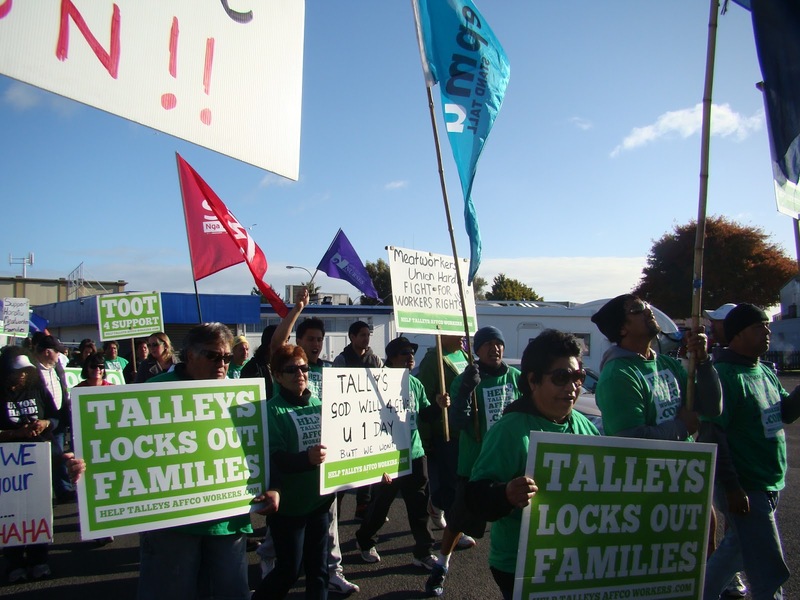 Despite their own hardship, Talleys-AFFCO workers have been energetic in supporting other workers in struggle, most notably at the Ports of Auckland. On Satuday, Auckland wharfies repaid the favour, several travelling down to Te Puke to support the meat workers. Help is also coming from other directions. With so many families facing hardship, many iwi have put pressure on Talleys-AFFCO – significant as many of the stock that end up at AFFCO meatworks are iwi-owned. Make no mistake – this is a class battle. Just as their predecessors did during the Waihi gold miners’ strike 100 years ago, AFFCO workers in Te Puke have found local business owners to be largely unsympathetic. More support is needed from workers in other unions. $50,000 is being donated by the union movement every week. This is a great start, but doesn’t go far when 1,500 workers and over 5,000 children are affected – as CTU President Helen Kelly told the rally, it’s under $50 per family per week. Every unionist shoud organise a collection in their workplace and community. There are details at www.mwu.org.nz on how to donate – anyone can organize a collection, and make sure money keeps coming in. In Wellington this morning our comrades collected over $550 for the meatworkers at the Newtown market. People who came to our Dunedin branch meeting last Thursday donated $75 to the fund, and last week unionists in Dunedin collected over $400. Collections are being organized by other political groups, unions, and individuals in the community too. “I plan to stay strong until the end” says Finlay, who works at AFFCO Rangiuru. When he does, it will be a victory for all the workers of Aotearoa – so we should fight together to make it happen. « Wellington Queers the Night!